The Coppermine is a unique and stunning whitewater barrenlands expedition. The river has a long and interesting history. It was made famous by Samuel Hearne’s 1772 reconnaissance for the Hudson’s Bay Company to confirm reports of copper deposits along its shores. This trip is for paddlers, who are looking for the thrill and stunning beauty of a remote barrens trip. 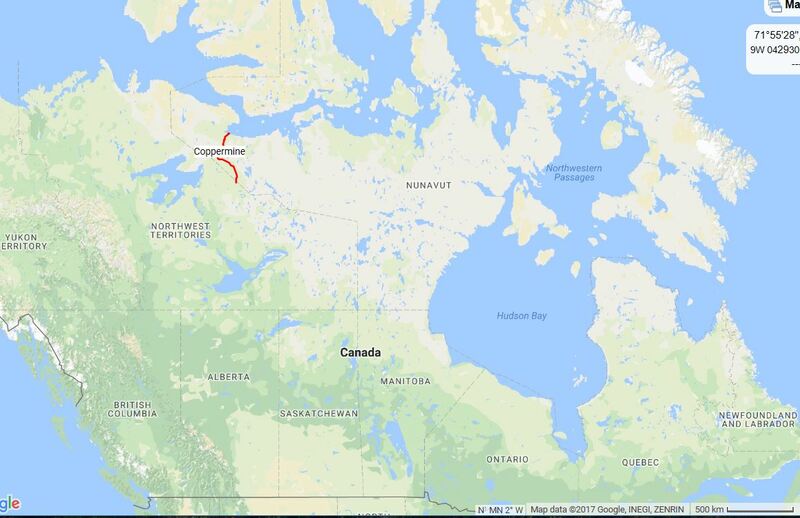 The group will meet in Yellowknife the night before the trip begins. You may stay in a hotel (we can give you suggestions), or camp out. Please give us your flight and accommodation details and the guides will attempt to contact you the evening or day before. You are responsible for all hotels and meals in Yellowknife. 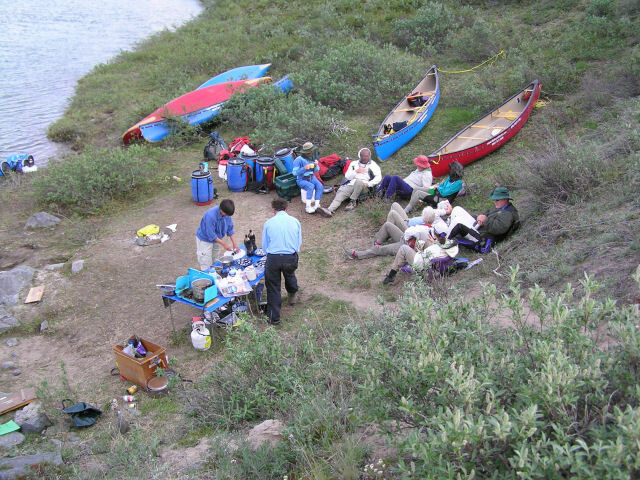 Day 1: After an early breakfast, we will load our gear and board a float plane bound for Hepburn Lake on the Coppermine River. We will be passing over taiga landscape, a myriad of waterways and an environment that hosts a wide variety of fauna which we will get a closer look at in the days to come. Weather permitting, we will be on the water by mid- day in time for a review of canoeing strokes and whitewater maneuvers. Day 2-3: Today we will head off down the Coppermine River. During this first portion of the trip, the river contains various swifts and RI rapids and the current, while gentle, is consistent. Fish are abundant and we will also see many birds of prey, such as golden eagles. We will pass the aptly named White Sandy River with its white sand cliffs. On the islands at its mouth we can view Arctic terns nesting by the hundreds. Shortly after this we will enter the RI-II Fairy Lake rapids. Our day ends on the huge flood plane at the mouth of the Fairy Lake River. From here we can walk for half an hour or more up the shores of this river as it races down into the Coppermine. Excellent fishing for grayling and char are highlights of this site. Day 4-6: The light current will help us along as we make our way through various islands and widenings in the river. 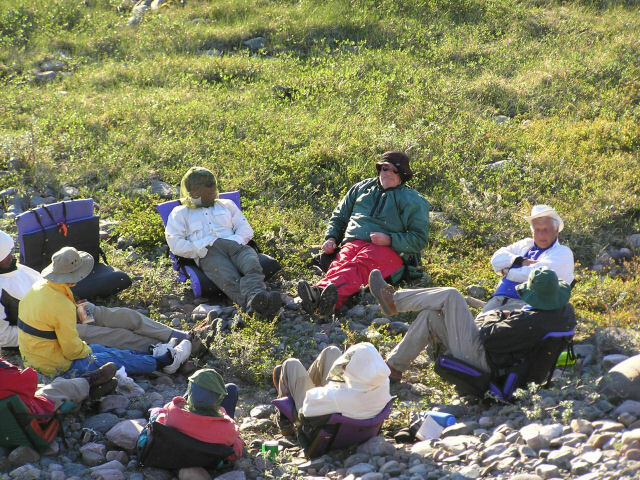 Moose abound in this stretch of the river and caribou become more abundant as we pass the Arctic Circle on Day 4 or 5. 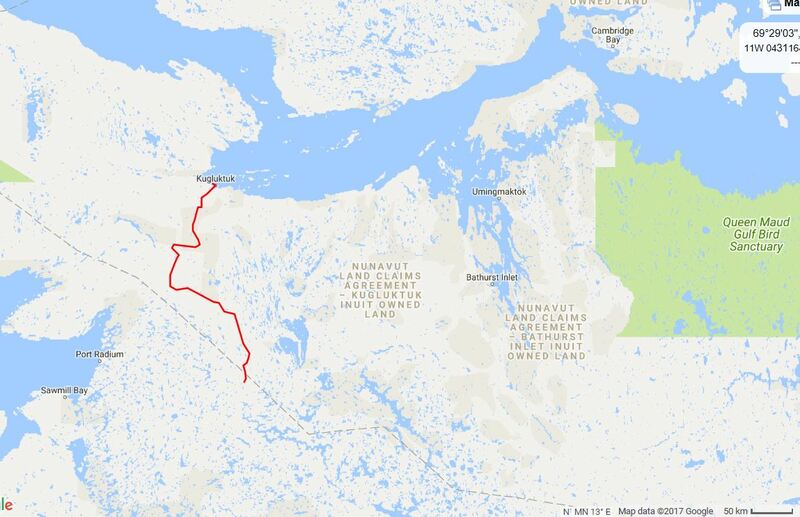 Day 7: The current picks up through “Big Bend” where the river again turns north toward the arctic ocean. After passing through a large RI rapids, you will get a panoramic view of the surrounding hills from the river valley. Day 8: As we approach “Rocky Defile”, the current picks up and the impressive canyon walls appear. At this rapid, named by John Franklin in the 1820s, you can either take the 1 km portage or run through the large and challenging rapids of the canyon. Numerous birds of prey, particularly gyre falcons, can be seen nesting in the cliffs. Shortly below the “Defile”, we will stop for a short hike up the Kendal River Canyon, one of the historic routes to the Coppermine from Great Bear Lake and the MacKenzie. 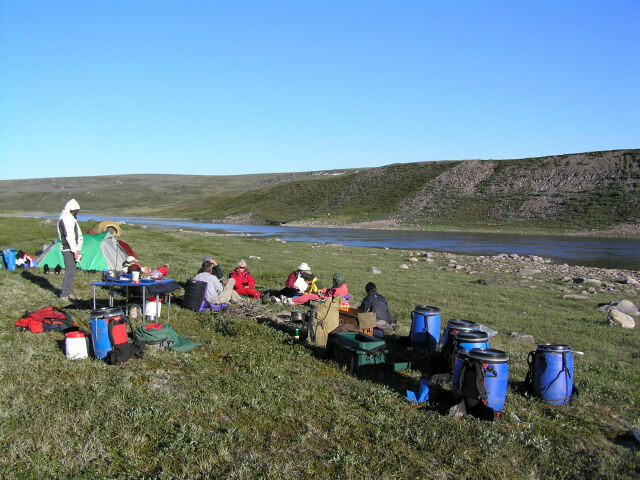 Day 9: Today we will be camped in the midst of the Coppermine and September Mountains, and will hike up the river valley to the treeless barrenlands. Day 10: As we continue through the September and Coppermine ranges, we will pass Melville Creek. 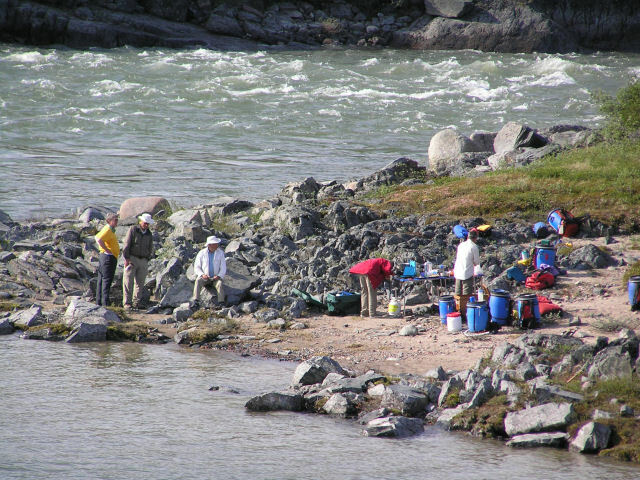 We will stop here for some excellent char fishing before continuing on to “Muskox Rapids”. 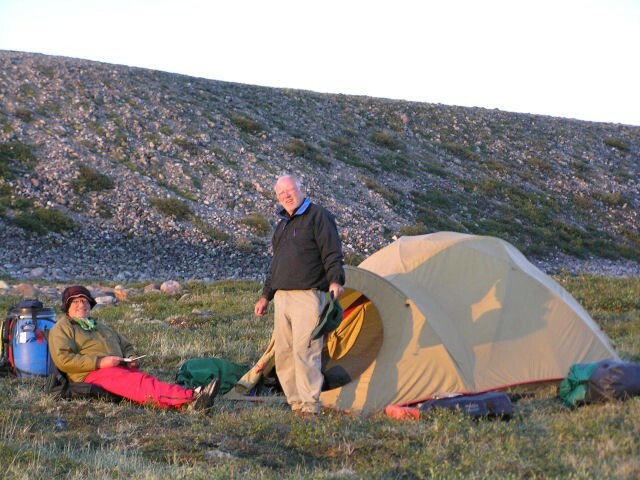 This site, so named because Franklin killed several muskox here for food, provides an excellent view of the rapids which we will negotiate the next day. 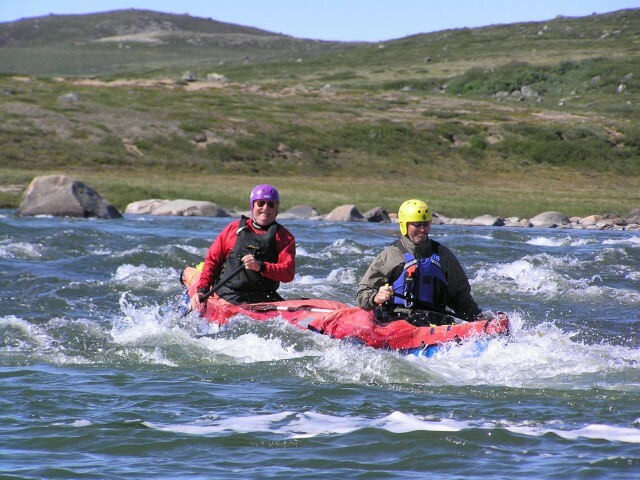 Day 11: After descending “Muskox Rapids”, one quickly enters a section involving many miles of exciting rapids between high red sandstone cliffs. These cliffs are interrupted occasionally by dramatic intrusions of basalt which greatly affect the course of the river. The native copper, from which the river got its name, becomes increasingly evident during this section if one takes the time to do a little investigating along the shore. Day 12: Early in the day we will encounter a long stretch of RII ledges in the midst of which a tiny river plunges through the cliff walls forming an impressive little falls complete with deep pools for swimming. We will make a short stop here to swim and hike up the canyon. Carrying on, the red sandstone cliffs change to grey basalt as one approaches “Escape Rapids”, from which Franklin had a narrow escape. These can either be portaged or run with care. From here it is a swift paddle for the next 10km to “Bloody Falls”. Day 13: “Bloody Falls” is the location of the bloody murder of a party of Inuit by Samuel Hearne’s native guides in the 1770s. It affords us a panoramic view of the Coronation Gulf from the high hills behind the campsite. 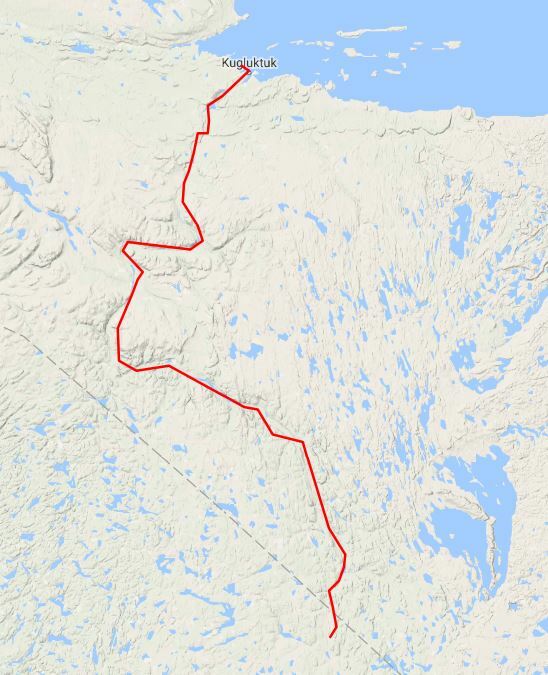 After a short hike and an exploration of the Falls, we will complete the portage and descend the final 15 km of the river to the village of Kugluktuk (Coppermine) on the Arctic Ocean.